Hi guys, part of our planning for growing amazing gardens this year was to check out a ton of gardening books from the library. We've been gardening since we were kids, but there is always more to learn from experts! Even casual gardeners can offer tons of shortcuts, tips and tricks. We need to do our research on the plants that we are growing for the first time. We also just love reading, and some of these books are filled with beautiful photography that makes us even more excited about our gardens! Today we'd like to tell you a bit about four of our favorite books about herb gardening. 1. The Herb Society of America's Essential Guide to Growing and Cooking with Herbs, edited by Katherine K. Schlosser. This book does not have step-by-step growing instructions, but it gives general guidance on how to grow herbs. Many herbs are listed individually, with brief descriptions of the plants, their growing habits and requirements, plus historical use and recommendations for using them today. This book is mostly text, with line drawings of each plant (but no recipe photos). The second half of the book contains over 100 recipes, organized by Appetizers, Beverages, Breads, Soups and Sandwiches, Salads and Salad Dressings, Main Dishes, Vegetables and Side Dishes, Desserts, and Simple Ideas: Sauces, Blends, and Extras. There is a convenient recipe index so you can search for the herb you want to use. I'm excited to try the Fresh Herb Cheesecake on p. 116 and the Lavender Ice Cream on p. 217, among many other delicious-sounding recipes. 2. Homegrown Herbs: A Complete Guide to Growing, Using, and Enjoying More than 100 Herbs by Tammi Hartung. Tammi Hartung starts at the beginning, going step-by-step through planning and designing and herb garden. Then she teaches how to prepare the soil, propagate herbs, and plant them in the garden. Next she covers caring for the herb plants and dealing with insects and disease. There is a great harvesting chart, and then some fun chapters: Making Herbal Preparations for Medicine and Personal Care, Cooking with Herbs, and Herb Personalities. This last chapter lists a lot of information about each plant and how to grow and harvest it, with color photos, suggestions of what to plant next to it, how to cook with it, and home pharmacy uses. This would be a great book to buy, as it has such a wide breadth of information, plus lots of lovely photography. I think I would refer back to it a lot. I definitely want to try the herbal foot soaks on p. 146 and herbal vinegar from p. 154. 3. Herb Gardening from the Ground Up by Sal Gilbertie and Larry Sheehan. I really enjoyed the conversational writing style in this book. Gilbertie shares a bit about his family history with gardening and his own journey into herb gardening. He then advises how to start an herb garden from scratch: planning, amending the soil, and choosing herbs. He recommends buying small plants to start with, but if you want to grow them from seeds, like we are doing, he gives great instructions on starting the 15 most desirable herbs for kitchen use. He gives brief instructions for caring for your garden and harvesting herbs. There is a large section on different themed herb gardens. Gilbertie tells which herbs to choose for each type of garden, and illustrations of where to plant each one. He shares plans for 43 types of herb gardens! A few interesting ones are the Tea Garden (which includes calendula, chamomile, and four kinds of mints, among others), a Bread Garden (which includes poppy, rosemary, and thyme), a Cake and Cookie Garden (including apple and nutmeg scented geraniums), a Home Bar Garden (including anise, lemon balm, and tansy), the Dyer's Garden (including madder, dyer's broom, bedstraw, and woad), and several color-themed gardens (the Silver Garden includes curry, lamb's ears, lavender, and licorice). The last section is the Herb Culture Guide, which briefly lists the most important information about each herb: annual or perennial, height, how to propogate, and Latin name. Then there are instructions on harvesting and storing the 15 basic herbs, and finally a very helpful schedule for planting, transplanting, and harvesting herbs. 4. The New American Herbal by Stephen Orr. This one is gorgeous. It has tons of beautiful color photographs. Every herb and each recipe has at least one photo. There is quite a bit of information about each herb, including its current and past uses in cooking, medicine, science, and magic. I could flip through this one for hours, reading whatever page catches my attention. I'm excited to make flavored oils on p. 33 (to go with the flavored vinegar I learned to make in Homegrown Herbs), an herb topiary from p. 32, and herb soda on p. 34. Do you have any favorite books about herb gardening? We'd love to know. Hi everybody, it's time to start planting our Herb Garden and Dye Garden seeds! If you're just joining us, check out these posts to choose your seeds and gather what you need to start them inside. Here in Zone 5, it's time to start the seeds that need 10-12 weeks of protected growth. In about three months, it will be time to move them outside to the garden. I started with indigo and madder for the Dye Garden, and basil, rosemary, cat grass, and catnip for the Herb Garden. I also started some vegetables, unrelated to our project gardens: celery, lettuce, artichokes, spinach, and leeks, plus little viola flowers. The indigo and madder seeds both need to be soaked for 24 hours before planting, so I put them in cups of water the day before I wanted to plant. These seeds also need to be planted in wet soil, so I again pre-watered the pots I planned to use. You should pre-water all your soil-filled pots, and especially the seed-starting pellets, so the seeds can start absorbing water as soon as they're planted. If the soil is dry, it can hold on to the first water you give it instead of letting the seeds take it. The rest of the seeds can be planted without pre-soaking. Place one or two seeds in each starter pot, cover it with a little more soil (read the seed packet to see how deeply to plant each type of seed), and press down gently. Then gently water them with a watering can or use a spray bottle to mist the top of the soil. I've been misting mine, so that I don't disturb the seeds. I mist quite a bit to make sure the seeds are wet enough. They need to stay moist, so don't be stingy with water. But don't flood them, either. They shouldn't be sitting in a puddle of water. Next put on the clear plastic cover, which creates a greenhouse effect, trapping the moisture and heat inside to help the seeds germinate. If you don't have a cover, you can use a cute cloche, any clear glass dish or bowl, or even plastic wrap to cover the pots. Add a plant marker, so you'll know which plants are which. You can write the plant names on popsicle sticks, make cute homemade markers, or use store-bought plant markers. Or make a diagram of the planting tray on a piece of paper and jot down which type of seeds are in each row. Anything that helps you keep track of what's what will be fine. 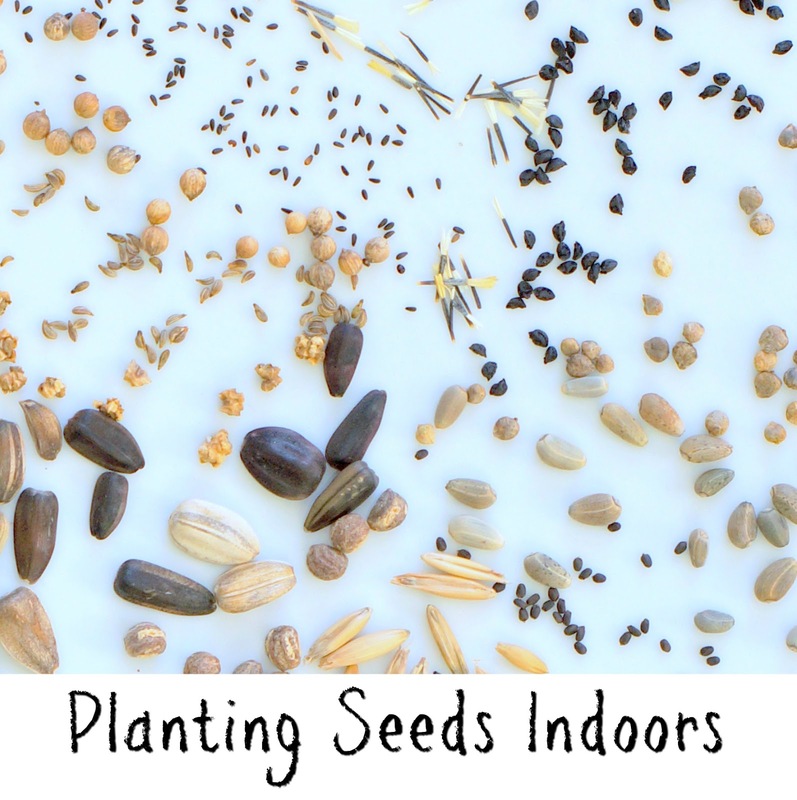 You should check on your seeds each day, misting or watering them when the soil looks dry. The seed packets will say how many days it will take until the seeds germinate, so you'll know how long you have to wait until you see little sprouts. In the meantime, keep the soil damp but not soaking wet. Keep the temperature as stable as you can by reducing drafts and using a clear cover to help keep the seeds warm. I also planted a few things that I'll grow in larger pots, rather than transplanting them into the garden. I can move the pots outside for the spring and summer and let the plants grow on my porch. In the fall, I'll bring them back inside where they can keep growing through the winter. I love having fresh herbs year-round, and they can be so expensive to buy in the winter. It will be great to have basil all the time! I'm also growing some spinach and lettuce in pots, which taste so much better when they're fresh. And I planted catnip and cat grass for our pet to nibble on. To start seeds in these larger pots, I filled them most of the way with regular potting soil. Then I put a layer of seed starting soil on top. That way the seeds have the best medium to get started, and the plants have the best medium to grow in once their roots go deeper. We'd love to hear what you're growing, and we'd be happy to answer any questions you have!